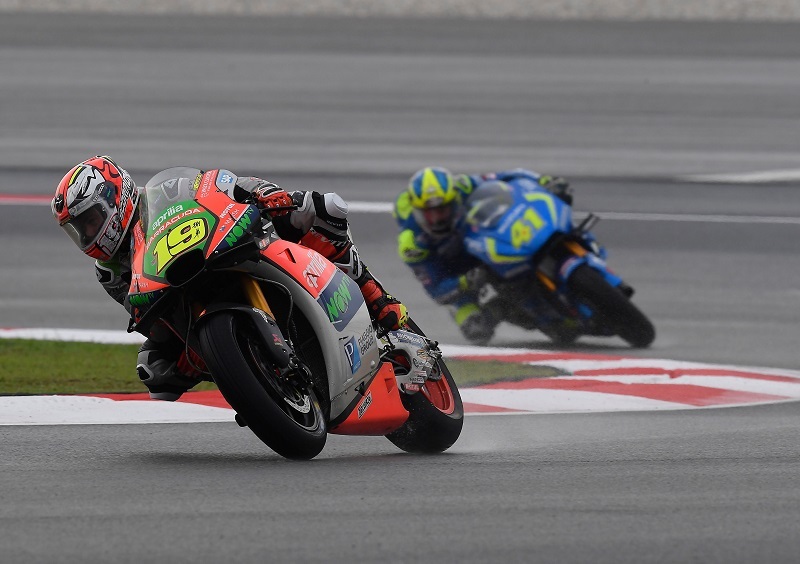 Alvaro Bautista skilfully administered his Aprilia RS-GP in the initial phases of the race, when a lack of grip kept him from expressing himself the way he had during practice where he earned a spot on the third row of the starting grid. Fourteenth after the first lap, the Spanish rider’s progression had him overtaking Smith, Pol and Aleix Espargaró and Miller in the following laps, moving into ninth place. The crashes by Marquez and Iannone then decided his seventh final position, a great result that matches the one achieved in Japan two weeks ago to confirm the progress that the RS-GP has made in the second half of the season. “We had a very interesting weekend, where we showed our increasing competitiveness, thanks in part to the new engine specification that allowed us to take a step forward in terms of top speed. In particular, Alvaro was in the top 10 throughout practice, both on the dry track and in the wet. The race was peculiar because of the conditions. I think that we need to take a step forward in terms of chassis and electronics setup when the track is very wet, but this is part of the growing process in this first season. I’m sorry about Stefan, who had shown excellent signs in the warmup session, but in the same way, the slide in the race is all part of the game”. “Seventh place is a good result that came at the end of a weekend that was definitely positive. We demonstrated good performance throughout practice, even achieving the best starting position yet with Aprilia. In the race, however, we found conditions that were very different from the rest of the sessions. There was much more water, so the feeling with the bike was not the same. I controlled the situation in the first laps, taking care not to make any mistakes and trying to achieve as much as possible. We saw a lot of crashes. The track was anything but easy so, considering the fact that the sensations in the saddle were not the best, we can be satisfied with the result and head to Valencia to finish this season well”. “Not an easy weekend for us. Because of the variable weather and having a few new components to test, we were not able to prepare for the race in the best possible way. On top of that, I had the crash, after which I was able to rejoin, but I lost time and positions. I am disappointed. All we can do now is go back home and set our sights on a good result in the last race at Valencia”.